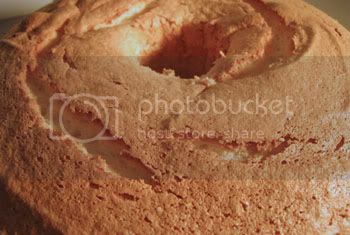 Just before Christmas, Cooking for Engineers' (CFE's) posted a recipe for Strawberry Glazed Angel Food Cake. It's kept my appetite whet for angel food cake ever since. I hadn't made one in, well, a very long time, since trying to reduce the amount of white sugar and white flour in my diet, and especially since the language of glycemic index (GI) hit the lay man's vernacular. But I like angel food cake. Years ago, before Atkins and other low-carb regimens, it was considered a healthy dessert, suitable for those trying to lose weight - since it had few calories, was fat-free, and could be gussied up easily and deliciously with any type of fresh or cooked fruit (also fat-free, and a good fiber source). I'm salivating now. It's reassuring to see that amidst the low-carb trend, the American Heart Association continues to list it in its dietary guide. * GI is a measure of how high your blood glucose will rise after consuming a certain food, relative to consuming pure glucose (GI=100). GIs less than 55 are considered low. GIs greater than 70 are considered high. 2 Sift together, at least three times, cake flour and 1/3 cup sugar. 3 In a large mixing bowl, whisk the egg whites until just frothy. Sprinkle the cream of tartar and salt over the froth and continue whisking until soft peaks form. Start to sprinkle in the sugar, 1 tablespoon at a time, as the mixer (you or a Kitchen Aid) continues whisking. Stop whisking when all the sugar has been incorporated, is mostly dissolved, and egg whites form stiff peaks. Note: If you're using a stand mixer (which can produce peaks in no time! ), keep the speed at low-to-medium until all of the sugar is incorporated. You don't want stiff peaks to form before all the sugar has been added. Turn the speed up to medium-high at the very end to stiffen the whites. 4 Sift or sprinkle the flour/sugar mixture over the egg whites, about 4 tablespoons at a time, and fold in gently using a clean spatula. Sprinkle the vanilla extract in 1/2 tsp. increments between additions of flour. Note: Use an up-from-the-bottom fold-motion. Four or five folds ought to be enough to incorporate each flour addition. When all the flour has been added, fold the entire batter a few more times until no dry-flour areas remain. 5 Spoon into a 10 by 4 in., two-piece tube pan or angel food cake pan. Bake for 35 minutes at 375°. Turn the oven off and allow cake to continue browning for about 5 to 8 minutes more. Cool, inverted, until completely cool, 2 to 3 hours. 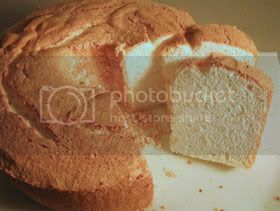 Note: An angel food cake pan usually has three tabs extending up from its rim so the cake may be inverted while cooling. If your tube pan is not tabbed or your cake extends above the tabs, invert the cake over the neck of a funnel, beer or wine bottle. No jumping jacks in the kitchen while cake teeters on bottleneck. 6 When cool, slide a thin knife between the cake and the pan to dislodge. Slice with a serrated knife. You'll need to wipe the knife clean about every third slice to keep it from tugging and pulling the cake. Note: Slices shown are the suggested 1/16 serving size.